The Seven of Wands. Valour. Courage. Defiance. Aggression. Glory. Individualism. Everyone for themselves. 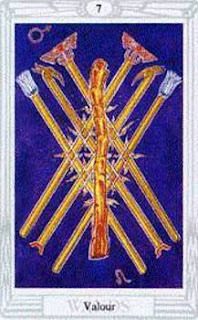 The Seven of Wands corresponds to the Sefirot Netzach: weakness, the degenerate, creativity. Anarchy. Like Geburah, Netzach has a sense of chaos surrounding it, but not the random chaos of first motion; it is ordered, degenerate chaos. The energy of the suit of Wands is frayed as it leaves Tiphareth and approaches Netzach, changing form. As such, the energy seen in Netzach is a distorted, twisted, degenerate form of the energy seen in Tiphareth; the anarchy of unity. In the Naples Arrangement, 7 corresponds to Bliss – in some ways in the sense of rapture and reveling in the quality of being, and lustful abandon. When one takes the elements and qualities of the suit of Wands and uses and displays it with abandon, one reaches Valour. Valour in itself is not always a bad thing, and many might consider it very similar to Victory and Virtue; but there are key differences. Virtue is a set of passive characteristics, that others see in you without overly much action on your part. Valour is a set of active characteristics, its adjectives placed on you for your bold actions. Victory is triumph as a group, where the preceding elements of Fire come together. Valour has much of this energy, but is instead focused on the individual, not the group. The pride one has as a result of the Six of Wands is the result of group action. As such, the energy Valour represents is the more selfish, degenerate form of the triumph and acclaim of Victory. As such, Valour represents courage, defiance, standing up for what you believe in (passionately), aggression, and glory (glory is different from pride in that pride is what you have in yourself; it measures self-confidence and assurance, while glory is how others perceive you, and measure your esteem in the eyes of others) – but in the sense of you as an individual. The group is not important to the concept of valour; only the individual. This fraying of the energy manifests itself also in that instead of one unified triumphant group, one has many glorious and brave individuals, and creates an environment of competition, like was seen in Strife (though this competition is not as negative as seen by Strife) – everyone for himself. Let the most valorous man win. The art on the Rider-Waite card emphasizes this cards aspect of defiance; a man is holding a wand defensively, seemingly fending off attackers from below. He holds the high ground, and keeps fast to his position. He has conviction. The Thoth artwork is very similar to the art on the Six of Wands; the same grid of Wands is shown, but the steady flames of the Six have been replaced by small, short bursts – like the passionate short bursts of flame that represent passionate individuals who do not rely on others. Additionally, on top of the grid is a seventh wand, seemingly ablaze and about to consume itself, and dividing the grid as well. This serves as a warning; the valorous individual (the burning wand) will take down not only himself, but will divide others too. In a reading, the Seven of Wands indicates the need to examine your individual sense of pride and possibly arrogance, or acting courageously and temporarily taking the glorious path forward. It can also ask you to consider what your strong beliefs are, and to find where you stand and hold your point. Reversed, this card asks whether or not there is enough individualism in you; have you been so subsumed in a group that you have no real individual identity? Have you been hiding? Is it time for you to step forward and use your courage?